This technique is projected to reduce solar panel manufacturing costs by upwards of 60% compared to industry standards, while making them 25% more efficient, and resulting in a very cost-effective source of energy. Energy Returned Over Energy Invested - a concept introduced in a paper by Dr John Morgan, which I found in Principia Scientific under the heading The Catch-22 of Energy Storage. Chris Martin for Bloomberg Technology: Elon Musk’s Tesla Motors Inc. reached an agreement to buy SolarCity Corp. for $2.6 billion, about $300 million less than an initial proposal criticized as a “bailout” for the solar company in which he’s the largest shareholder. Georgia Institute of Technology: New computer modeling suggests that high temperature TPV conversion -- which captures infrared radiation from very hot surfaces -- could one day rival combined-cycle turbine systems when combined with thermal storage using liquid metal at temperatures around 1,300 degrees Celsius. Antony Michels for Yahoo Finance: David Schaefer wants to sell $50,000 kites to farmers to help them generate electricity by harnessing the power of the wind. 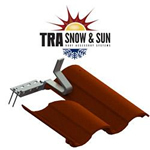 You haven't installed a tile mount that is easier to install than the Solar Tile Mount manufactured by TRA Snow and Sun. Solar Tile Mount is used on all tile roof profiles: flat, mid, and high. It is made in the USA of aluminum alloy for strength and excellent corrosion resistance. Solar Tile Mount is built to allow more ease in installation with more rise from the tile surface to the rail for better air flow below panels. The adjustable base is longer than most allowing attachment 6" to the left or right to have the bracket in the base of the pan of the tile and still fasten to the rafter. Solar Tile Mount is adjustable for counter batten systems from ¾" to 3". The horizontal rail is directly above base fasteners giving greater uplift resistance than any other system. For superior waterproofing apply TRA Snow and Sun's butyl backed VersaFlash aluminum flashing. No tile flashing is needed on top of the tile for greater labor and material cost savings. We offer a range of PV mounting solutions designed specifically for residential applications. For installers, homeowners, and solar panel manufacturers, Roof Tech represents the next generation in reliability, innovation, and ease of installation.